These administrative areas are accompanied by seven-digit postal code: Tōkyō-to, 100-8111 or 〒100-8111 東京都 in Japanese, for the Imperial Household Agency in Tokyo, or Hyōgo-ken 650-8567 (〒650-8567 兵庫県) for the Hyogo Prefectural Government. The next area is either a municipality (市 shi) or, in the country, a county (郡 gun) or a village (村 mura or son). The largest cities are subdivided into wards (区 ku), followed by districts (町 chō), neighbourhoods (丁目 chōme), blocks (番地 banchi) and, finally, individual buildings (番 ban). Modern buildings, business or residential, often have names. If a building holds more than one floor, the floor number is usually listed in the US fashion of indicating the ground floor as the first floor (1F), the first floor above the ground as the second floor (2F) and B1F, B2F, etc. standing for floors below ground level. 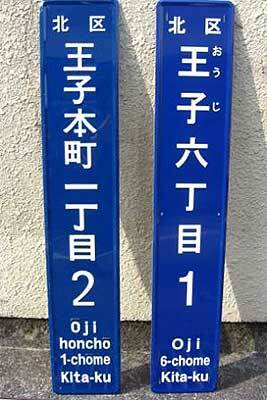 In the case that one banchi is occupied by just one building, the address will consist only of two numerals. Four numerals, on the other hand, indicate a separate business within the building. Buildings usually feature small metal tags with their number (3-1-14 or just 1-14 in case of the WWF above), while lampposts or other objects often bear bigger plaques (see the photo above) indicating the district name in Chinese characters as well as the block reference (in our WWF example 1-14). Locating addresses can pose quite a challenge to foreigners and Japanese alike, and even taxi drivers seem to have occasional problems finding their destinations. Make it a rule to have an address written down in Japanese and English, in order to ask at train or bus stations, or even better, at the local koban (police box), which always have very detailed maps of their local area and can provide you with the most minute details, the next good ramen restaurant for example. In case all precautions fail, and you got hopelessly lost, use the phone: people will usually be glad to pick you up from the nearest station or the kōban. How does the Japanese addressing system work?